In 1858, Charles Darwin published On the Origin of Species by Means of Natural Selection, or the Preservation of Favoured Races in the Struggle for Life. The ideas put forth by Darwin in this book were not particularly new—other scientists had already introduced the idea of natural selection and evolution before him. What Darwin brought to the table was evidence and the ability to unify these concepts into a streamlined theory of evolution. Nowadays, the idea of evolution through natural selection is widely known—but what does it actually mean, and is it still happening today? In its most basic definition, natural selection can be defined as “survival of the fittest.” It’s easy to think of how this definition applies to a single individual—a person can be fit and they can survive to an old age. But that’s not exactly what natural selection is referring to. In practice, survival of the fittest applies to DNA and its ability to be passed onto subsequent generations. The most common example of natural selection is that of the peppered moth. Prior to the industrial revolution, moths in the United Kingdom had a gene that caused them to be lighter in color1,2. Occasionally, a moth would be born with a change in the DNA that caused them to be darker, but these darker moths were less common. However, once industrial pollution deposited large amounts of soot in the environment, white moths became less common as the dark moth population soared1. Natural selection isn’t the only force acting on the human genome. Another factor at play is known as the founder effect. Among other things, the founder effect explains how a family in Kentucky came to have blueish color to their skin. Learn more about the Blue People of Kentucky here. In this example, the genes that make moths dark were present in the moth population all along, but it was a disadvantage for them to be dark because they stood out to predators. As a result, black moths were less likely to survive to adulthood and reproduce, meaning the dark versions of these genes were less fit and less likely to survive. Once the industrial revolution took place, it became advantageous for moths to be dark. Now, moths that were born with darker coloration were more likely to survive and reproduce—passing on the “dark” version of their genes to their offspring—while the white moths were less likely to survive and pass on their unique set of genes1,2. What’s important to note here is that individual moths couldn’t change their color. Once they were born with the light or dark colored genes, they were stuck with them. What changed was the population frequency. Based on the environment, the moths that were born with a darker color were more likely to survive and pass the darker color (and their genes) to their offspring. 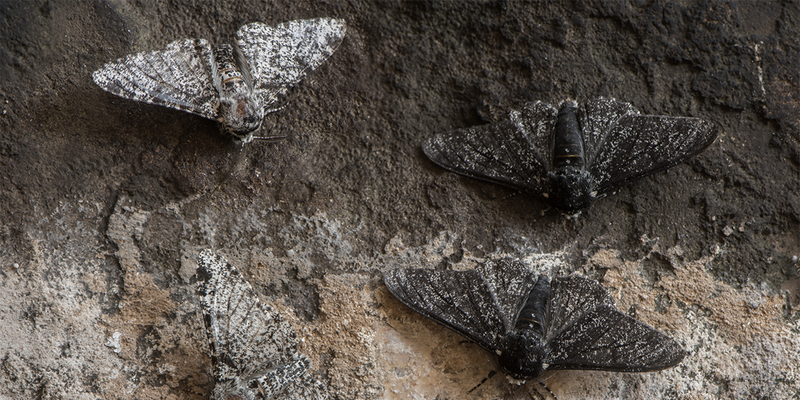 After multiple generations of this pattern, the genes that resulted in a dark color and allowed the moths to survive became more common in the population, and thus the peppered moth species evolved to have darker coloration. Natural selection also applies to humans. We know that the ability to digest milk as adults became common in some populations due to pressure from natural selection3. At one point in time, few people could digest a sugar in milk known as lactose. If an adult did drink milk, they would likely experience gastrointestinal issues that, in more primitive times, could have been lethal4. By chance, some people inherited a variant in their DNA that helped allowed them to digest lactose as adults. When we started domesticating cattle, the ability to consume dairy products may have provided them a survival advantage. As a result, there’s evidence that in some parts of the world, people who could digest milk were more likely to produce children with the same ability3,4. This is one reason why many people today can comfortably eat and drink dairy products while others cannot. Natural selection is just one of the evolutionary forces that have molded the human genome. Other factors include population bottlenecks, founder events, and genetic drift. Typically we look at natural selection and these other forces as pressures that shaped our past. While we can’t know what the future will bring, it’s clear that natural selection will continue to act on us and shape the way we grow as a species over time. 1Cook, L M, and I J Saccheri. “The Peppered Moth and Industrial Melanism: Evolution of a Natural Selection Case Study.” Heredity 110.3 (2013): 207–212. PMC. Web. 14 Sept. 2018. 2Walton, Olivia C., and Martin Stevens. “Avian Vision Models and Field Experiments Determine the Survival Value of Peppered Moth Camouflage.” Communications Biology, vol. 1, no. 1, 2018, doi:10.1038/s42003-018-0126-3. 3Gerbault, Pascale et al. “Evolution of Lactase Persistence: An Example of Human Niche Construction.” Philosophical Transactions of the Royal Society B: Biological Sciences 366.1566 (2011): 863–877. PMC. Web. 11 Sep. 2018. 4Curry, Andrew. “Archaeology: The milk revolution.” Nature, vol. 500, no. 7460, 2013, pp. 20–22., doi:10.1038/500020a.